Are you a last minute Christmas gift shopper? Or are you the organised type who already has your gifts wrapped and under the Christmas tree? Why do I ask? 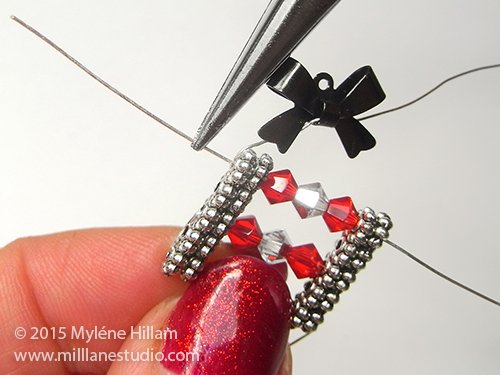 Because Day 8 of the Twelve Days of Christmas brings us All Wrapped Up - perfect little gift packages made of sparkling crystals, topped with an unusual black bow. They are really stunning! 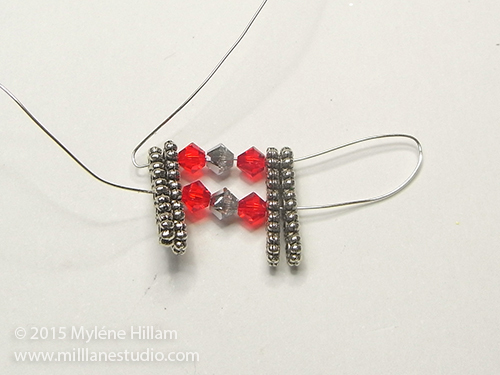 Cut the wire into two equal pieces and set one piece aside for the second earring. 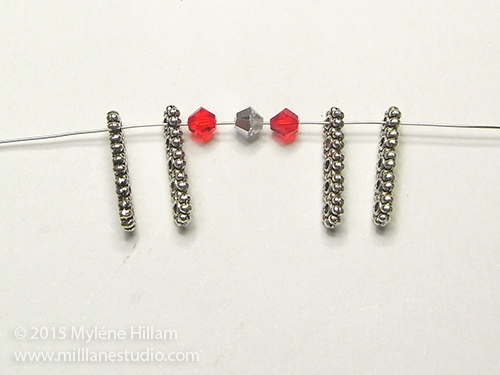 String two spacer bars, a Lt Siam crystal, a Silver Night crystal, a Lt Siam crystal and two more spacer bars on the wire and leave a tail of 12.5cm (5"). 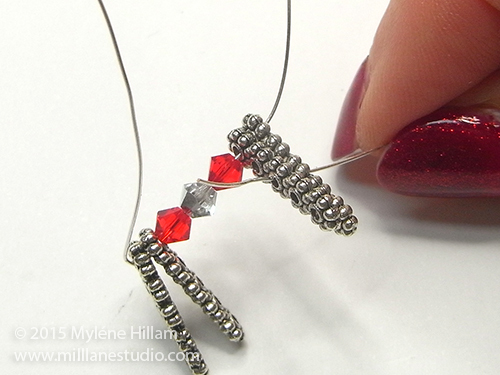 Bend the wire on the left hand side upwards so the components don't fall off. Insert the long end of the wire into the centre hole (from the outside) on the right hand side of the spacer bars. 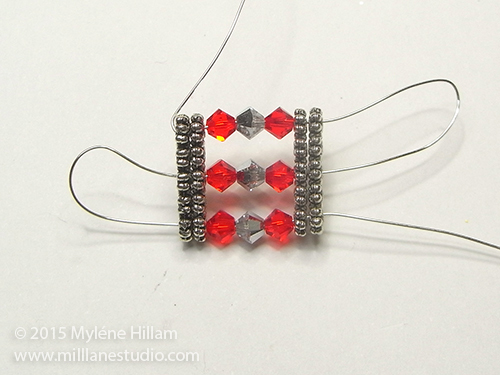 Following the pattern from the first row, string three more crystals. Insert the wire through the centre hole on the left hand side. Do not tighten the loop yet. Insert the wire through the bottom hole on the left hand side (from the outside) and string three more crystals as before. Draw the wire through the bottom right hand hole. 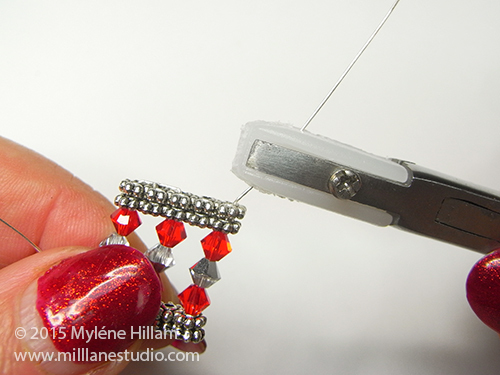 Use the pliers to pull up the wires tightly, first on the right hand side and then on the left hand side. 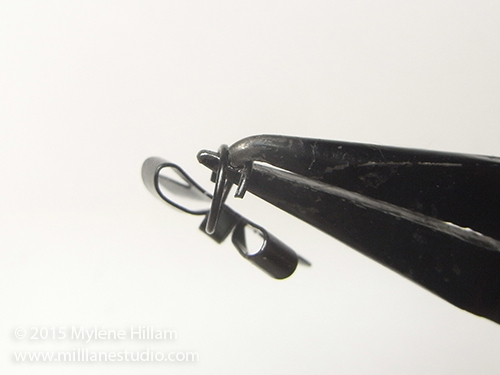 Place the pliers around the spacer bars and flatten the wire on the outside. Do the same thing on the left hand side. 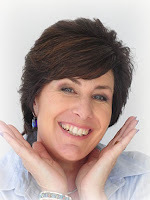 Run the wire through the nylon jaw pliers to straighten out any kinks. 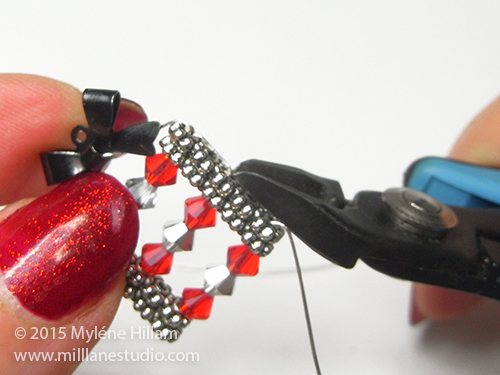 Open the split ring with the split ring pliers and remove it from the bow charm. 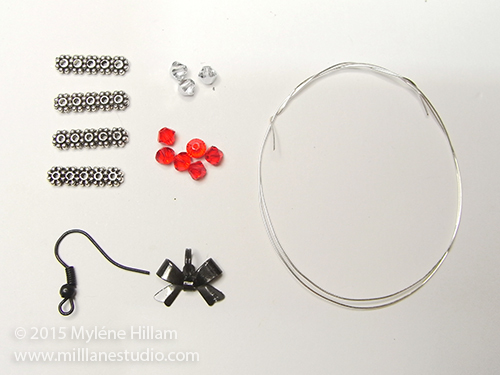 Set the split ring aside for another project. Insert the end of the longer wire through the loop on the front of the bow. 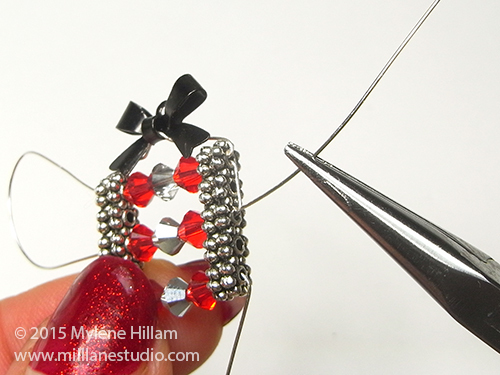 Lay the wire across the top of the gift and find the centre point. 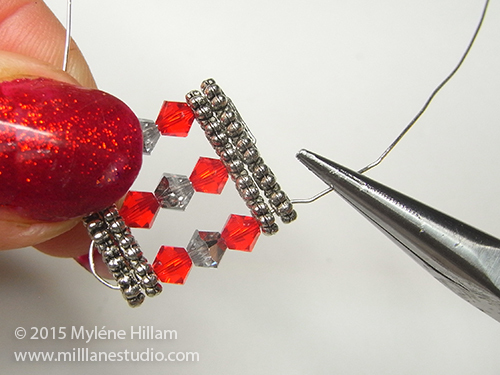 Grip this point with the chain nose pliers and bend the wire on either side of the jaws. 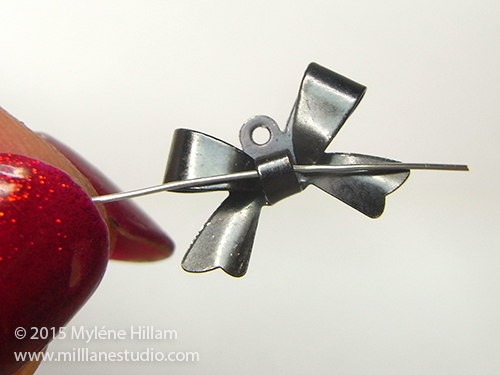 Slide the bow charm along to this point and manipulate the wire so that it sits behind the tails of the bow. It should look like this from the back. 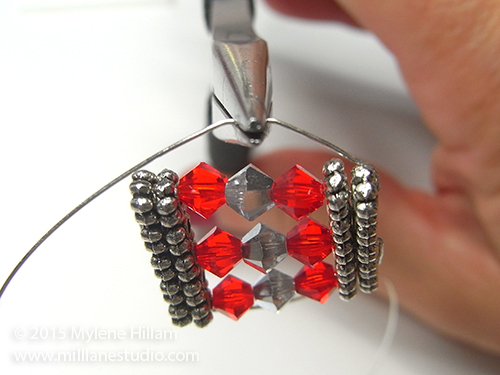 Insert the wire through the outside of the top row and back through the spacer bars and beads. 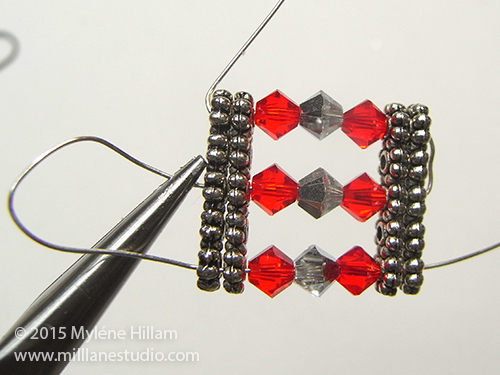 Feed the wire through the middle row of bars and beads. Pull it up tightly and trim the wire flush with the spacer bar, taking care not to cut the other wires. Do the same thing with the remaining wire. 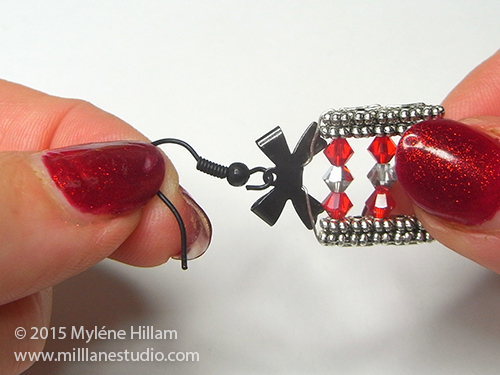 Open the loop of the earring wire and attach the gift. 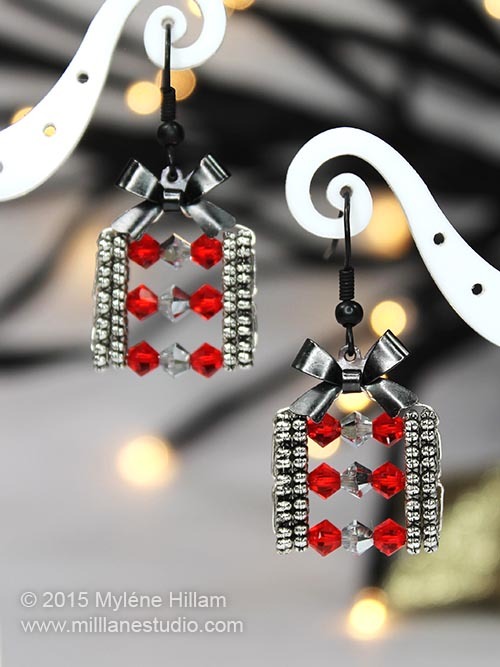 These simple earrings are really eye catching in red and silver, but you could make then up in other colours and they would be equally stunning. 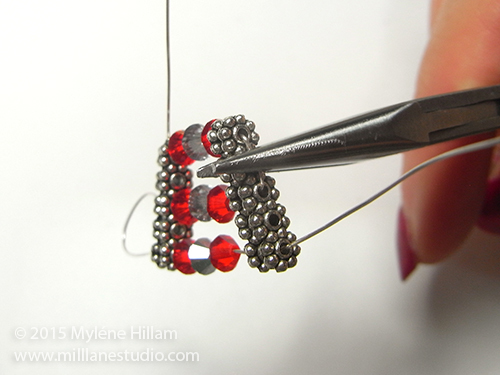 You could even change up the pattern of the beads to create different "wrapping paper". 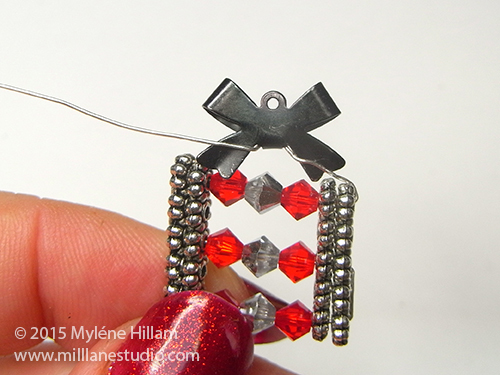 Look out for the next pair of earrings in the Twelve Days of Christmas Earrings Extravaganza in the next day or so.